We’re bombarded with books and programs about how to live healthy. And if you do get sick, the idea is that you probably caused it yourself, as a result of your lifestyle. There certainly are bad habits that trigger diseases. But the 21st century environment is filled with so many toxic booby traps that missteps are practically guaranteed. People who develop illnesses tend to wonder if it was something they did. The answer is that yes, it was something they did: Lead a relatively normal 21st century lifestyle. I was reminded about this reading an article by David Zinczenko, author of the book, Eat This, Not That! Zinczenko identified eight food additives you should avoid, and I’m sure he’s right that they cause all sorts of havoc with the nation’s health. The problem is, who is willing to take the time in a supermarket aisle to study the ingredients on a box of prepared foods after a 10-12-hour day and a minimal amount of time to get home and prepare a meal? The real question is why the federal government allows carcinogens in commercially sold foods in the first place, but that’s a subject for another day. Zinczenko says the FDA (Food and Drug Administration) has OK’d 3,000 food additives. For most people, the days when you raised a chicken, grew some potatoes and carrots in a garden and popped them all into a pot for a homecooked meal have melted into the haze of history. Chances are if you ask your grandmother about cooking in the old days, she’ll start talking about when TV dinners came in aluminum trays and you had to bake them in the oven. A little more surprising was his take on carmel coloring, used in many of your favorite soft drinks. Carmel is made by cooking down sugar and water, and that’s fine. But soda companies make it by treating sugar with ammonia, and the resulting carcinogen may be responsible for 15,000 cancer cases in the U.S. every year. So, go ahead and live healthy and eat healthy. But good luck negotiating all of the environmental landmines that have been created in the interest of producing cheap, convenient products that have long shelf lives. Step carefully. And another thing, as my uncle used to say. These new twisty-turny compact flourescent lightbulbs are exposing people to ultraviolet rays, potentially damaging the skin. A team of researchers at Stony Brook University found that tiny cracks in the bulbs’ coatings are the culprit. 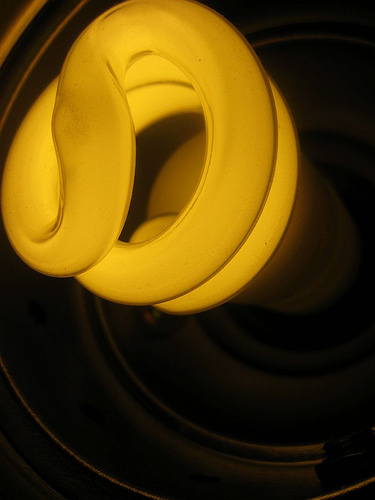 “Our study revealed that the response of healthy skin cells to UV emitted from CFL bulbs is consistent with damage from ultraviolet radiation,” said Miriam Rafailovich, an engineering professor at Stony Brook. “Skin cell damage was further enhanced when low dosages of TiO2 nanoparticles were introduced to the skin cells prior to exposure.” Regular incandescent light of the same intensity had no effect. Save a couple of bucks on your power bill, turn around and spend it — and more — at your dermatologist’s office.